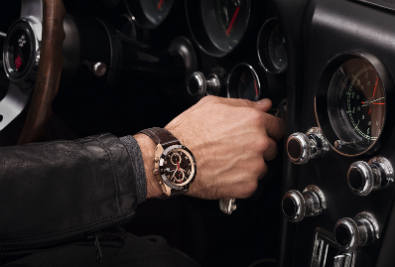 Dubai: Timing, technology and motorsport action are all to be found on Montblanc’s exhibition stand at this year’s Dubai International Motor Show, where the luxury Maison is showcasing the motor racing heritage that has inspired Montblanc’s new TimeWalker collection. The collection finds its inspiration in timepieces from Montblanc’s watchmaking Minerva Manufacture, which was known as an exclusive workshop producing high-quality instruments for measuring brief intervals of time with remarkable precision. The renowned “Rally Timer”, a stopwatch that was created to time motor racing with precision, is the perfect example of this heritage. The TimeWalker collection combines these legendary timing instruments of the past with the spirit of motor racing, encapsulating the Minerva heritage, superb technology, masculine energy, winning performance and the style of the glory days of racing. Visitors to the Montblanc stand at the motor show can also enjoy some competitive slot car racing action with the best time earning the champion a Montblanc TimeWalker Chronograph. Of special tech appeal, Montblanc is showcasing the Summit smartwatch – introducing fine watchmaking codes to the connected watch world, and Montblanc’s Augmented Paper – pairing the enjoyment of a natural Montblanc writing experience on real paper with the efficiency of digitizing work. Montblanc is located in The Watch Lounge, Hall 5 at Dubai International Motor Show. The show runs from 14th – 18th November 2017 at Dubai World Trade Centre.